There are many user-generated features for Ingress, however, many aren’t allowed under the Terms Of Service by NianticLabs. Luckily, this innovation is. If you’re not content with the standard badge that’s been offered for a long time, and you want a custom community/team specific badge for your personal identification uses, then this Badger is for you! With an intuitive interface, easy to read instructions, and the ability to customize your badge like never before, Badger is head and shoulders above the rest. Initially designed by Kevin Lanni, Brandon Graham and Nathan Brandt for Enlightened Agents only, it has now been opened to Agents of both Factions. 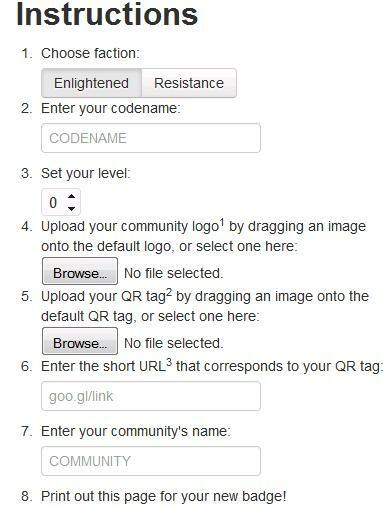 Just upload your community/group logo, enter your Agent Information (level, faction, and codename) press print and Voila! You now have a License to Hack. 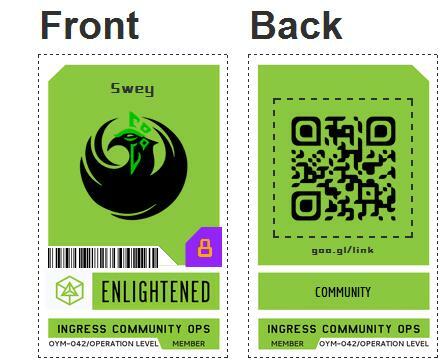 (valid only on Earth, does not apply to Interdimensional beings of unknowable power) Badger also allows you to place a QR code on the back for quick sharing of the Ingress App, or community page. If you have any other Ingress Innovations, or examples of people going above and beyond for Ingress let us know below or on the DecodeIngress G+ page. The http://www.playingress.co.za/badge/ generator webside is offline. So when is the website coming back online? Or is it?